I have been told that I am opinionated at times. Perhaps. However, some things are just plain wrong. I agree and, in theory understand and practice moderation. Well, I practice moderation in moderation. Yes, my little taters, your favorite and mine; the root vegetable we all love to root for, Pomme de terre, Earth Apples, Spuds. The fearless, flexible and oh, so very humble, potato. Nobody gives potatoes for Christmas anymore, and it’s a dog gone shame. Or, I could simply remind you of what you are missing. 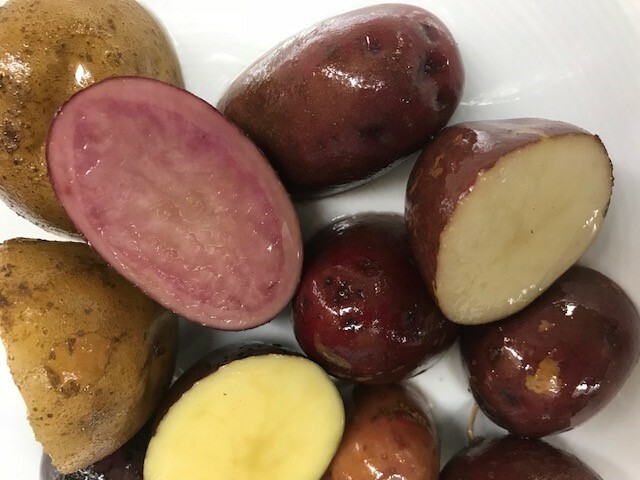 Potatoes are an invaluable source of potassium, a tremendous source of vitamins B6 and C, high in fiber, zero cholesterol, or fat, low in sugar, low in sodium. Holy Spud! These things are good and good for you! The best part of potatoes is that they are delicious. They are easy to prepare, roast well in large quantities, and are a great addition to any meal. You all know, I should hope, that you will have washed all of your potatoes, and let them dry a bit. Cover with cold water, add a tablespoon of salt, bring to a boil, reduce to a simmer, check every five minutes (give or take) and pierce with a fork or knife to test for doneness. A couple of schools of thought. Parboil small potatoes for approximately 10 minutes. You want them halfway cooked. Remove from water, let dry for a few minutes. Place in bowl, add Olive Oil, salt and pepper, and mix enthusiastically (some may say vigorously) with a wooden spoon. The goal is to rough them up a bit, but not break them. This brings some of the starch to the surface. After a few minutes of potato punishment, pour onto a cookie sheet, and bake at 400 degrees for about 45 minutes. The release of starch is supposed to add a crispiness to the finished product. Sliced, diced, fried, boiled, mashed. I’ll happily (and gratefully…get it. Because you can grate potatoes?) accept a bag of spuds for any reason. Especially lovely, local, luscious Bartlett’s Farm Grown potatoes. Now that’s a gift worth giving and getting!